We’ve never seen a rental contract that forbids feng shui. There are a lot of great reasons to want to decorate your rental. Your home isn’t just the place you live — it’s an expression of your inner self. The colors you surround yourself with, the lighting, the window treatments and floor covers all reflect your values, your spirit, and your individuality. And it works both ways — it’s hard to be a free spirit if you’re forced into sterile, clinical, cookie-cutter environment. It might seem like there’s not a lot you can do about your floors. You’re not going to be ripping up any wall-to-wall during your stay. But that doesn’t mean you can’t put your own spin on over the floors. Throw rugs can add style and texture and color to your floors — even on top of the wall-to-wall! Because you can take them with you easily when you move, throw rugs make a great floor dressing. Walls are usually the easy part — the challenge when dealing with decorating your walls is knowing when to stop. 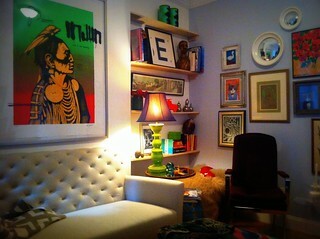 A couple of well-framed pieces of art will beautify a space much more completely than a dozen posters. Alternately, if you’re concerned about space in your new rental, strongly consider hanging decorative mirrors — they can give the illusion of significantly more space. Few rental contracts forbid you from changing the window dressing, but most will ding you for not restoring the originals before you leave. So carefully take down whatever is there and set it aside in a safe place, and feel free to install any non-permanent window solution you please. If your space is particularly small, hanging the window dressing outside the actual edge of the window can make them appear larger. Naturally, this is where you want to focus the majority of your attention. Not only will well-designed furniture express your nature, but you can squeeze in some practical concerns here as well. By choosing furniture that is multi-functional — say, a bookshelf with a desktop workspace on top, or a sofa with a trundle bed underneath — you can maximize space and utility at the same time. Renters may not be able to remodel their homes, but that hardly keeps them from redesigning the spaces they rent. It just takes a little bit of cleverness to design a space that demonstrates who you are and is still a wonderful place to live.